Video games, like all software, have bugs. Even non-computerized games can have interactions the designers did not intend. If an expert does anything he can to win, then does he exploit bugs in the game? The answer is a resounding yes. The player cannot be bothered to interpret the will of the game designer as far as which moves are “fair” and which moves are not, or which moves were intended and which moves weren’t. It’s irrelevant anyway. The player knows only moves that lead to winning and moves that don’t. Mysteriously, some games do expect the player to divine the will of the designer, and expect him to adhere to a set of behavioral rules on top of the actual rules of the game. This is the fundamentally flawed concept embraced by most massively-multiplayer online games. Consider World of Warcraft as an example. In a town, you can go on rooftops and you can fight against other players, but you can’t fight other players while on rooftops, or you’ll receive a warning. (Actually, this was totally legal before 3/11/2005 at 9:44 PM PST, but not legal after.) You can kill the same monster all day every day to “farm” in-game money for yourself (in fact you practically have to), but you can’t farm “too much” or you’re labeled as a gold-farmer and banned. If you break your line of sight with a monster, he often has trouble getting to you, which allows your friends to kill him much more easily. Smart play or grounds for suspension? Answer: grounds for suspension. If a monster is chasing you, you can go into a lake where he can’t follow and wait for him to give up. Smart play or grounds for suspension? Answer: that one’s smart play. The complex web of made-up rules is not unlike the shackling self-imposed rulebook of the scrub. I’m here to tell you that legitimate competitive games are not like this. Reasonable games have built-in rules and simply do not allow illegal moves to happen in the first place. Tournaments for reasonable games sometimes have to impose extra rules, but they keep this list as clear and as short as possible. There are games that are just for “fun,” because you can’t “win” them or make reasonable tournaments out of them. These games—while interesting—are not within the scope of this book. So what lengths should a player go to in order to win? 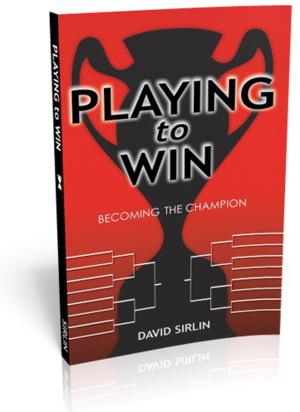 A player should use any tournament legal move available to him that maximizes his chances of winning the game. Whether certain moves or tactics should be legal in a tournament is a totally separate issue that we’ll get to later. For now, the issue at hand is that if it’s legal in a tournament, it’s part of the game, period. Players often fault other players for “cheating” or playing “dishonestly” when they use tactics that should not be allowed in a tournament, often because they are exploits of bugs. The player is never at fault. The player is merely trying to win with all tools available to him and should not be expected to pull his punches. Complaints should be taken up with the governing body of the tournament (or the community of players) as to what should be allowed in a tournament. This is a dead simple issue that confuses too many players.